1) The photo with the most repins receives an item of their choice from http://taylorjoelle.com/ and their photo will be featured on the “Photo of the Month” section of this blog. 2) A second prize winner will be chosen at random from all of the submissions and will receive a $15 promo code to http://taylorjoelle.com. Photos may be submitted until 11:59pm on March 25th. Submit your photo by sending it to brooke@taylorjoelleblog.com. The child in the photo must be wearing Taylor Joelle. Include a caption for your photo and your name for identifying you when you win. Only one photo can be submitted per family. If the photo has a photographer’s logo, we will need permission from the photographer before posting it. Collages of photos will not be accepted for entry. Please submit only one photo. 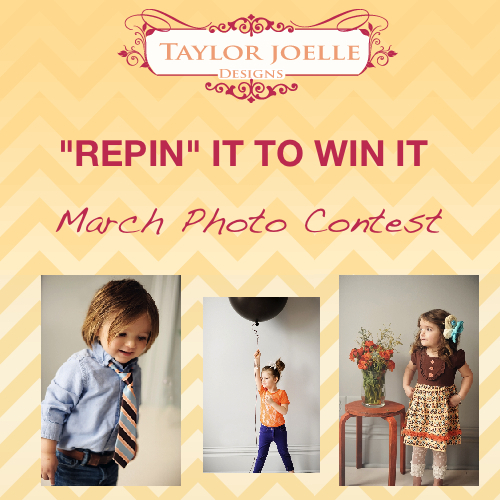 Photos will be “pinned” to the March Photo Contest Pinboard on the Taylor Joelle Pinterest Page. To vote, repin the photo. The photo with the most repins is the winner. ONLY REPINS OF THE PIN ON OUR BOARD WILL BE COUNTED. Repins of repins will not count. Please have your friends and family repin our original pin of your photo from the Taylor Joelle pinboard for their vote to count. Voting will end at 11:59 pm on March 29th. Any votes placed after that time will not be counted. The winners will be announced the morning of March 30th. Good Luck! We’re looking forward to your entries!